Nowadays, virtually all web sites publish a syndication feed, or RSS feed, of their site’s content. 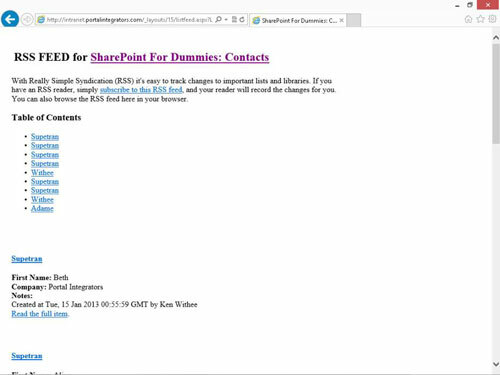 SharePoint 2013 sites are no different. In fact, every app in SharePoint can publish an RSS feed. You can even create RSS feeds based on views, which means you can filter what gets published to the RSS feed. If you subscribe to the feed, you’re pulling the information. However, you can also subscribe to alerts to make SharePoint push updates to you. RSS feeds are a popular way for people to keep track of updates to a web site without visiting that site. To use RSS feeds, they must be enabled for the app. If you see the standard RSS button in the app’s Ribbon, RSS feeds are enabled. If RSS feeds are disabled, the button appears in the Ribbon but is disabled. In your app, click the List tab of the Ribbon, and in the Settings group, click the List Settings button. The List Settings page appears. If you’re in a Library app, click the Library tab of the Ribbon and click the Library Settings button. In the Communications section, click the RSS Settings link. If you don’t see the RSS Settings link, RSS isn’t enabled for your site. You can enable RSS settings for your site by clicking the RSS link in the Site Administration section of the Site Settings page. RSS must also be enabled for your web application by the SharePoint farm administrator. On the Modify RSS Settings page, select the Yes radio button under the Allow RSS for This List option. You can also use this page to configure the settings for the apps default RSS feed, such as the feed’s title, columns, and item limit. After you finish configuring the default settings for your app’s RSS feed, click OK to save your changes. Each list and app has its own RSS feed. Therefore, you must configure RSS for each app where you want to use RSS. Browse to the app where you want to view the RSS feed, click the List tab of the Ribbon, and click RSS Feed button on the Share & Track section. Most browsers display the RSS feed using a built-in style sheet for formatting. Subscribe to the feed using your browser as a reader or paste the web address for the feed in the feed reader of your choice. You can also view the RSS feed for a specific view in an app. RSS must be enabled for the farm, site, and app. In other words, you can’t use RSS feeds if they aren’t turned on. You can also turn off RSS feeds for a given app or site if you don’t want people to use them. The default option is to allow RSS feeds. At the site level, RSS feeds are enabled in the Site Settings page. The RSS settings for an individual app are managed in the List Settings or Library Settings page for that app, respectively.